I HAVE ONE ARM. I OPEN SOME OF MY FOLDERS WITH MY FEET AND A CASEXX BLADE PICK. I HAVE BEEN WANTING THE GEC#97S FOR A WHILE NOW. 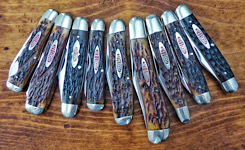 I HAVE 7 GEC#97S ON PREORDER. MY MAROON MICARTA AND THE BEAVER TAIL #97 CAME IN THE MAIL. I GOT BAR-B-Q AND FRIED CAT FISH STAINS ON THE MAROON MICARTA KNIFE TODAY. I OWN A 100+ KNIVES. THIS IS A 4 3/4" CLOSED KNIFE. THEY ARE THE SMOOTHEST BIG FOLDERS THAT I OWN. I HOLD THEM BETWEEN MY KNEES AND THEY OPEN RIGHT UP WITHOUT BREAKING MY THUMBNAIL. THE MAROON MICARTA #97 IS A GREAT WORK KNIFE. NOT BUYING THIS KNIFE BECAUSE IT NOT A NORTHFIELD IS INSANE ! The new #97 Autumn Gold jigged bones are being sent out to dealers next week. Well finally, now maybe we'll get some good Northfields! Here is my jigged cherry wood handled 97. One of 3 I early reserved. Like this one a lot. They did a very fine job on this wooden handled knife. nice little 'review' onearm. The micarta one looks very smooth & elegant, like an athlete in a tux. Edit to add: The maroon micarta #97 is so 'sharp' that i bought one last evening. The new sabre clip dual pull Northfield 97 in Eboooony!! What do you all think of this variation? Duffer wrote: The new sabre clip dual pull Northfield 97 in Eboooony!! What do you all think of this variation? Lloyd I think it is an instant classic, a must have . I can't wait for mine to arrive. Tsar Bomba wrote: I've got a reservation on the smooth yellow rose bone NF (frankly shocked that these reservations are still open regardless of production run length) and I think I'll be checking out the Tidioute jigged bone. The ebony NF is also on my radar, pending shield. Looking forward to these big hunters. I have mine on pre-order, waiting on an email to pay it off. I have two others and the Tidioute bone on the way. These are the smoothest hunter style knives that I have ever held in my only left hand. NO NAIL BREAKING ! I can't wait to test out the double nick knives , not like they are really needed. But they sure look cool. The Northfield 97 with ebony is one the home page of GEC website. How long before it gets to the dealers ? [quote="kootenay joe"]"like an athlete in a tux." Roland you are not only a knife connoisseur but a wordsmith as well. Very nice Gary. Seeing the Micarta one is making me think that I might need to pick up one of those also. I have the cherry jigged bone, the autumn gold bone on the way, an early reserve on the Ebony handled, and not sure on the stag. I convinced myself that I wouldn’t like the Micarta, but I was wrong, that’s beautiful. By the way, what does the circle w/ the 3 P’s stand for? But the way, what does the circle w/ the 3 P’s stand for? Thanks Gary, I wasn’t coming up with anything on my own. Here are two so far that have come in. I am liking the way these look side by side, makes for a pretty picture and display.